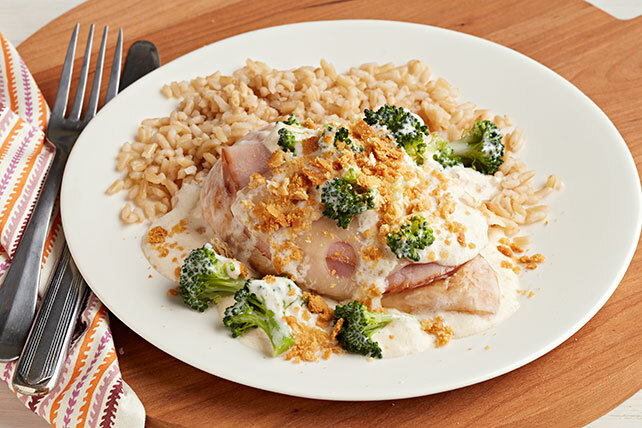 Get ready for dinner ahead of time with our Make-Ahead Swiss, Chicken & Broccoli Casserole! The whole family will love eating this make-ahead casserole. Line 9-inch square baking dish with foil, with ends of foil extending over sides; spray with cooking spray. Place chicken in prepared dish. Fold ham slices in half; place over chicken. Top with cheese and broccoli. Whisk gravy, sour cream and mustard until blended; pour over broccoli. Cover with foil; freeze until firm. Use foil handles to remove casserole from dish; place (with foil) in freezer-weight resealable plastic bag. Seal bag. Freeze up to 2 months. Remove casserole from freezer 24 hours before serving; place casserole (with foil) in 9-inch square pan. Refrigerate until ready to bake. Heat oven to 400°F. Bake casserole 20 min. Uncover casserole; sprinkle with cracker crumbs. Bake 15 to 20 min. until chicken is done (165°F). Meanwhile, prepare rice as directed on package, omitting salt. Serve chicken casserole with the rice. To prepare as a 2-serving recipe, cut all ingredients in half and prepare the casserole in a prepared 8x4-inch loaf pan. Or to double the recipe, prepare recipe as directed doubling all ingredients and using 2 prepared 9-inch square baking dishes. If desired, bake one casserole now and freeze the other until ready to serve another time. Heat oven to 400ºF. Assemble casserole in 9-inch square baking dish sprayed with cooking spray; cover. (No need to line the empty dish with foil first.) Bake 30 min. or until chicken is done (165ºF), uncovering after 15 min.